No two men are alike. Especially not when they are in love! Thus, if you go out looking for qualities that existed in your previous partner, you may be disappointed to find them non-existent in your present companion. However, this does not mean that there will be absolutely no overlapping of characteristics. Your life will become a lot easier if you do not expect much out of a new relationship. And if you learn to do that, your relationship with the Aquarius man will be perfect. The Aquarius man is represented by the water bearer in the zodiac and Aquarius - the sign is considered to be an air sign. Influences of both the elements are quite distinct in the Aquarius man. He is quite independent and likes his freedom. He is determined and very protective about his friends and family. He is also very intelligent and capable of striking a good conversation. Passion for love runs through the veins of an Aquarius man and this is what makes him one of the most romantic lovers in the list of zodiac signs. They never pretend to be in love thus, one can be pretty sure that they will never cheat or betray their partners. The Aquarius man expects the same level of commitment from their partners. They are easily annoyed if their partners flirt with other men and also refrain from revealing certain things they want to know. Sometimes, this nature makes them the dominant partner in their relationship. An Aquarius man does not take heart breaks sportingly and loses his temper at the drop of a hat. But then again, they recover from their failure in love very quickly and begin the search for someone new just as easily as they did the first time. An Aquarius man has no time for extra feelings and baggage in life. So if you are a girl who lives and breathes spontaneity, wit and charisma, you may find yourself being attracted to an Aquarius man. His radar will seek out the intellectual in you and that will allow him to maintain a successful relationship with you. When getting into a relationship with the Aquarius man, make note of the fact that you won’t be given extra attention than most of his other friends. You may find this weird, but for him, this is totally normal. The Aquarius man does not find anything wrong in dividing his time equally between you and his friends. And if you take offense, you are to be on your way out! 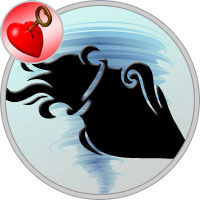 Not the one to express his feelings very often, the Aquarius man is rather skeptical about putting his emotions on the table for everyone to see. But, even though there is a little resistance and hesitance, you will be an important part of his life. And it would serve you well to never forget that during the time you spend with the Aquarius man. The Water-bearer dislikes following rules made by others, so he prefers to make his own. He’s an individual who definitely marches to the beat of a different drum. Carefree, spontaneous and daring, the Water-bearer will try just about anything once. To the Aquarius man, life is one big adventure. Anything new excites him, but his interests are often short-lived, as he gets bored easily and is soon ready to move on to another challenge. Unfortunately, this usually has a profound impact on his personal relationships. He might have a huge circle of acquaintances, but he rarely has many close friends. This often holds true for his love interests as well. The Water-bearer typically has a real problem with commitment. He doesn’t want to tie himself down with one woman when there are so many others to meet and experience. Being in love with an Aquarius man can be a roller coaster ride of ups and downs. At first, you may feel sure that you’re the center of his universe. But then he might suddenly lose interest for no apparent reason. He’s also moody – he’ll be perfectly happy with the relationship one day and depressed and gloomy the next. Once an Aquarius man does make the decision to commit, he’s steadfast. If you ever fully win his heart, you’ll find that he’s loyal, supportive and completely faithful. Because of the Water-bearer’s innate creativity, they might be found at art galleries, museums or craft shows. Their great compassion for others often gets them involved with various charitable causes, so you’ll likely find Aquarius men leading or participating in these types of events. These guys have an intense interest in anything mysterious, which provides another clue as to where you might find an Aquarius man. Attracting a male Water-bearer isn’t usually difficult. They love meeting new people and will most likely see you as a new adventure. The problem will be keeping his attention. He may try to completely analyze you by placing you under his microscope, but don’t let this happen too quickly. Maintain his interest by always keeping him guessing, but be honest with him. Once you’re in a relationship with an Aquarius male, never allow him to get bored. You’ll have to surprise him once in a while and provide occasional adventures and explorations. Also, allow him his space and his freedom when he needs it. If you don’t, he may feel trapped and will move on to his next potential love adventure.